Dr. Abel specializes in the surgical treatment of urologic malignancies. He has advanced training to surgically manage all types of genitourinary cancers including prostate cancer, bladder cancer, kidney cancer, testis cancer and penile cancer. 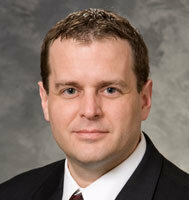 Dr. Abel is certified by the American Board of Urology. He performs open and laparoscopic surgery including surgery using the daVinci robot. Dr Abel’s philosophy is to provide maximal quality of life to patients by using minimally invasive approaches to cancer therapy whenever appropriate. He has a special interest in the treatment of localized and locally advanced kidney cancer. Dr. Abel conducts clinical, translational, and basic research in urologic oncology. Clinical and translational interests include improving patient outcomes after complex urologic surgery, improving prognostic ability for patient decision making, and multidisciplinary care of kidney cancer. Dr. Abel serves on the board of directors for the Society of Urologic Oncology (SUO) Clinical Trials Consortium.